LG8 Lower Ground, Bangsar Village 1 Jalan Telawi 1, Bangsar Baru 59100 Kuala Lumpur. Bangsar Village Lower Ground Floor, beside the Lower Ground exit from the mall. 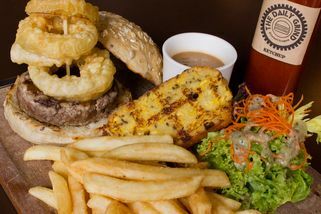 Do you love burgers with thick succulent meat patties and scrumptious sides? If your answer is yes, you’ll love The Daily Grind. 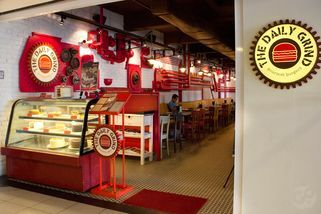 As depicted by the red decorative pipes that line their wall at their outlet in Bangsar Village I, The Daily Grind makes their own burger patties right here in the restaurant. Carefully selected fresh meat cuts are used, ensuring the quality of the patties. 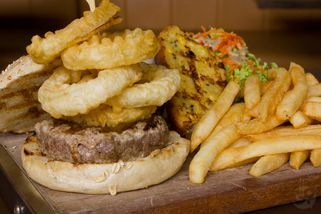 There’s a wide selection of gourmet burgers to cater to everyone’s palate. For those who want comfort food, try the Down on the Farm Burger. 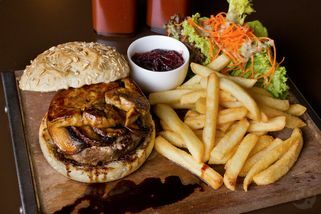 For those who fancy something grander, you won’t go wrong with the Foie Gras Burger. For those who prefer non-beef patties, there’s the Lamburgerni or the Downtown Tokyo Burger. 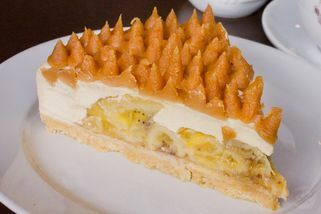 There’s also a selection of rich cakes; for example Red Velvet, Hummingbird, and Salty Choco Caramel for those who want to finish their meal on a sweet note. The Daily Grind, a gourmet burger joint situated in Bangsar Village, have been dishing out excellent burgers to hungry patrons alike. The outlet is almost all decked out in Red, usually an angry colour but in this case it's attention grabbing. Smart choice too, as Red colour has been shown to stimulate appetite. Although I suspect they don't need any special tricks to make people eat. I've been to The Daily Grind a couple of times, both times ordering the same burger. I guess I just can't resist anything with foie gras in it. Yes, they do indeed serve foie gras burgers. Priced very reasonably at RM58, this comes with a sizable piece of pan seared foie gras, over a juicy beef patty (to your preferred doneness, mine was medium.... being a little cautious with grind meat), balsamic palm sugar glaze, slices of portobello mushroom & a dollop of onion cranberry jam. The Foie Gras was cooked to perfection: slightly charred on the outside and unbelievably soft. The taste is rich, buttery, and delicate, the experience enhanced by the onion cranberry jam (house made with love). Just like what I'd expect. This alone deserved a 10/10 for this meal. But there's more! I enjoyed the portobello mushroom too, with just a hint of smokiness and as juicy as they come. The thick meat patty itself was done perfectly. They definitely do not skim on ingredients here. Even the buns are tasty, as they don't settle with your ordinary sesame buns (although there's nothing wrong with that either). Here you'll find oats and other interesting grains in your buns. I found myself breaking my low-carb rule by finishing all the bread. Oh, we haven't even talked about the fries yet! Perfectly seasoned, these are crunchy outside and delightfully fluffy inside. Delicious with their homemade ketchup. Now that I think about it, it's been too long since my last visit, so I must rectify this soon! I like the beef burgers which have thick juicy patties and a bun that is not too heavy (because it needs to soak the juice well). The cheeseburger is a classic and a must-try. The highlight of the place is the fries though. The right amount of crunch and good flavour, even after sitting there for 10 minutes. Hey, between burger and fries, I always eat the burger first, ok? And when you're with friends, it's rude to scarf everything down in 3 minutes. The staff are very friendly but they don't always get special requests right. They serve alcohol and have a lot of strange mocktails. Wouldn't mind trying it out for a quiet drink session with some buddies. Both times I left feeling satiated with burger. 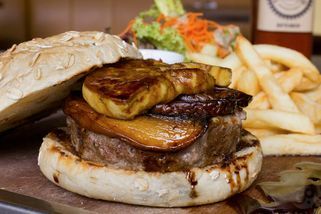 They have a vast array of burgers, classic and gourmet stuff as well, eg; for foie gras lovers. The Incredible Hulk mocktail was good, last time I had another drink and that was tasty too. 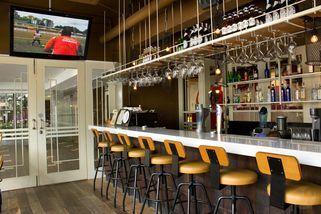 This restaurant was founded by some fellow foodies and has a very well-stocked bar, I certainly took a long time for me to visit and finally made it there this year, twice! My message to the owners, please think about having wet towels for the post burger moments. It is impossible to answer phone calls in between so I suggest that if you are about to dive into a burger, do get your handsfree kit attached to your ears if expecting urgent calls. I also love the convenient drop-off from the street level, makes it very disable-friendly and also good for folks with chaffeurs. Well-spoken staff, although they forgot to separate the pickles. From these 2 visits, I suspect that they make their own ketchup and chili sauces, but I did not get to confirm that.